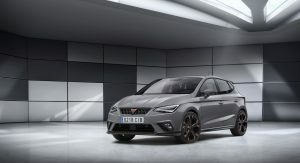 Following a major leak of the Cupra Ibiza design study, Seat has finally revealed details about its now standalone Cupra sub-brand and its first model, the new Cupra Ateca. 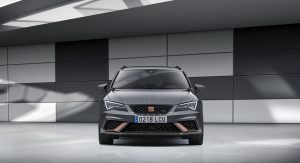 According to the Spanish automaker, Cupra is Seat’s independent high-performance brand with a distinct identity that will continue offering the company’s sportiest models. Its first model will be the Cupra Ateca, a compact SUV powered by VW Group’s turbocharged 2.0-liter petrol engine with 300PS (296hp). 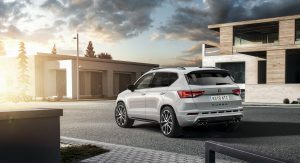 Power goes to all four wheels via a newly developed seven-speed dual clutch DSG transmission, enabling the new Cupra Ateca to score 5.4 seconds for the 0-62mph (100km/h) run while flat out it’ll do 152mph (245km/h). 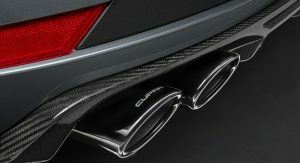 The chassis is fitted with an adaptive suspension as standard, which can be configured through the Drive Profile modes. 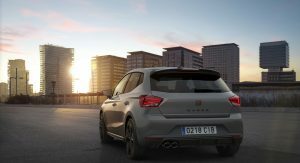 These include Normal, Sport, Individual, Snow, Off-Road and of course the CUPRA mode. 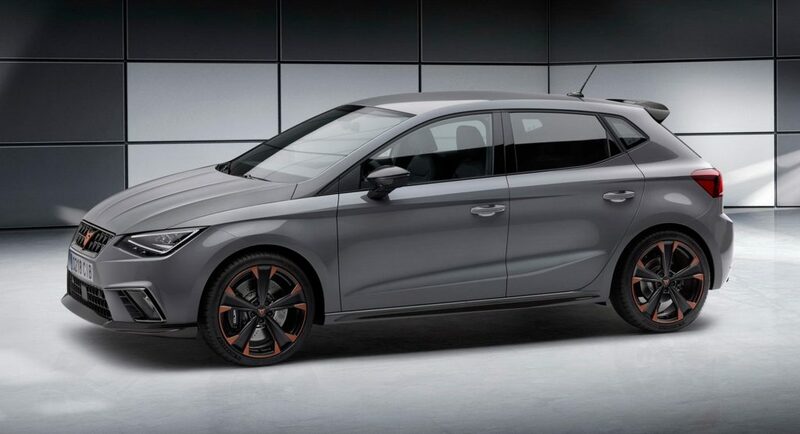 The exterior revisions are plenty and include not only sportier bumpers, side sills, a rear spoiler and a honeycomb grille but also the new Cupra logo. 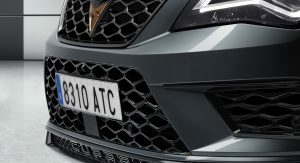 Matt aluminum Cupra letters are also found on the lower front grille while many exterior details are finished in glossy black. 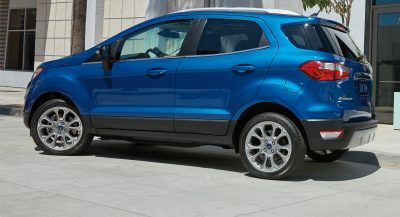 A set of exclusive 19-inch alloy wheels complete the exterior differences, along with the quad exhaust pipes. 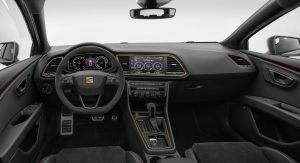 The cabin is covered in black Alcantara with grey stitching and feature aluminum pedals and glossy black trim detailing. 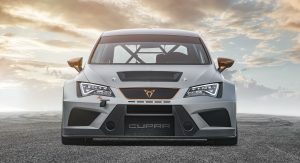 Cupra logos have replaced the traditional Seat logos everywhere while standard equipment includes keyless entry and start system, wireless charger, GSM signal booster, 360º top view camera, 8-inch infotaiment system, digital cockpit and more. 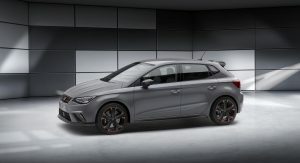 Cupra will also offer a Performance pack as an option. 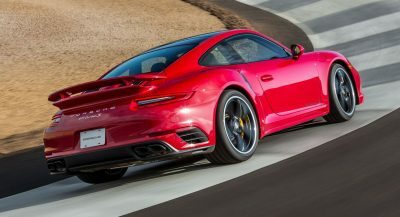 That includes bigger 18-inch Brembo brakes, carbon details inside and out as well as leather seats. 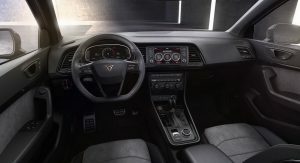 Exclusive Cupra bucket seats will become available from mid-2019. 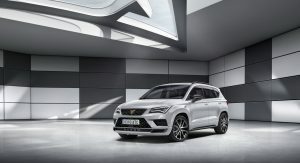 The new Cupra Ateca was accompanied a design study that essentially previews the upcoming Cupra Ibiza and with the company saying that they are also considering offering a high-performance version of the Arona SUV. 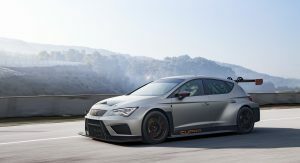 Seat’s Cupra also showcased their TCR race car, set to compete in the 2018 season, along with the latest special version of the Seat Leon wagon, called the Leon Cupra R ST. 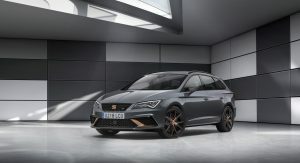 The new super-fast wagon is wearing the same coppered details inside and out with the limited Cupra R. Power comes from a turbocharged 296hp 2.0-liter TSI engine paired to a DSG transmission and all-wheel drive. 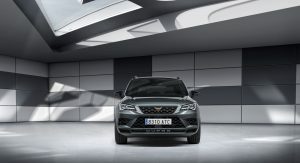 The new Cupra Ateca, along with the brand’s design studies and the Leon Cupra R ST will celebrate their public debut at the Geneva Motor Show. Why would they use a bronze Seat badges? Because it’s their new thing the mat bronze accents. 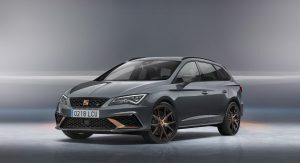 They could’ve used bronze Seat badges on the Cupra models alongside the chequered flag thing they used but in mat bronze and black, i think that would’ve been enough to, like you said, differentiate the Cupra models from the rest of the lineup. I think that is a pretty solid idea you have there. Would have been much nicer. This logo looks really silly. 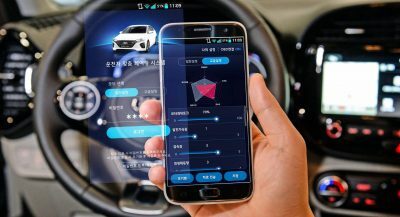 A new brand against Audi ? 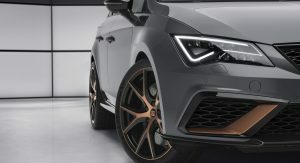 I don’t have problems with adding bronze styling elements, but the cupra logo needs to go asap. ugh… they had to copy the tacky logo in the lower grille like audi’s “QUATTRO”. I don’t see the point… seems to be aimed at video game players. That interior is as dull as ditchwater, especially for a sports model. If they change it people complain. Damned if you do, damned if you don’t. Brighten it up a bit at least. 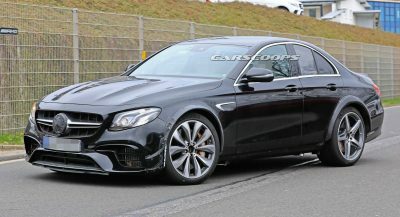 Some red highlights on trim/seats wouldn’t be the worst. I have mixed feelings. Having driven sporty Seats I can say they are amazing little cars, but these seem rather bland looking on the interior. Previous Cupras have been more radical to look at. 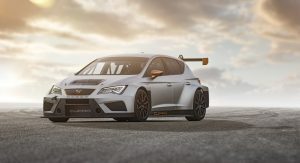 My fave will always be the round 2008 Leon Cupra in yellow. I loved them but they didn’t age well. The new logo is seriously bad. Anyway, the Ibiza looks alright. Although I still don’t like the bronze details. So now they are basically playing on people’s fond memories of Pontiac with this logo, or something?